The past few decades have seen businesses work hard to maximise their productivity and efficiency from their workforce. Part of this efficiency drive has been an acknowledgement of the importance of people. This is where the softer skills of people management and inter-personal relationships comes to the fore. This part of the business culture is driven from the top. All businesses need people. When people are not operating at an optimum, other aspects will suffer. Motivated content employees translates into increased business profitability. So where does the self aware leader come in to this dynamic? From my own observations of supporting CEO’s through crises over the past 20 years, I’ve experienced first hand how a high level of self-awareness of that leader directly impacts how the business weather’s the storm. Successful leadership requires the understanding others, their emotional needs and wants, their self-interest, overt and covert. These relationship competencies rely on a foundation of self-awareness. And you can’t know the truth about another without knowing it about yourself. Are employees treated as a commodity, a resource that is expendable or are they valued as the most important asset of the business? There is good evidence beyond my own anecdotal experience of the value of having a self-aware leader. Research conducted in 2013 by Korn Ferry analysts David Zes and Dana Landis confirms with a large body of data the direct relationship between leader self-awareness and organizational financial performance. The researchers analyzed 6,977 self-assessments from professionals at 486 publicly traded companies to identify “blind spots”—disparities between self-reported skills and peer ratings. At the same time, they tracked stock performance. They pursued the questions: “Did the individual leaders see themselves the same way others saw them? How significant is a culture with widespread feedback?” The frequency of blind spots was measured against the ROR of those companies’ stock. • Poorly performing companies’ employees had 20 percent more blind spots than those working at financially strong companies. 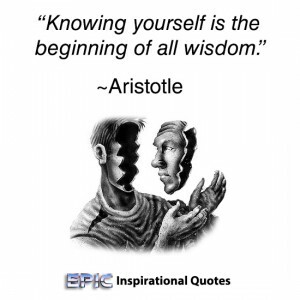 Self-awareness is defined as the capacity for introspection and the ability to recognize oneself as an individual separate from the environment and other individuals. The separateness bit is easy to understand but what about introspection? This is where things get a little more complex. The Oxford dictionary defines introspection as the examination or observation of one’s own mental and emotional processes. The same dictionary defines “mental” as being related to the mind and emotions as a strong feeling deriving from one’s circumstances, mood, or relationships with others. I’m beginning to think its like trying to define love, most people recognise it when they feel it but find it much harder to describe. For me, the self-aware leader is a person that has a degree of emotional maturity. They know their internal emotional state well and can regulate their mood. They have a rich vocabulary to describe how they feel and more importantly, they are aware of how they feel. They take responsibility for how they act upon their feelings. Self-aware leaders take responsibility for their actions, they don’t blame others when things don’t go to plan. They hold themselves accountable for their own actions. They live with honesty and have high integrity. These are all admirable qualities to live a life by and yet far more challenging to do in reality. What are these things called emotions? Emotions can best be described as Energy in Motion. This energy can take many forms and theorists as ever can’t agree on what the basic emotions are. It is said there are a few emotions that are at the root of all other emotional experiences within the human psyche. The work of psychobiological neuroscientist, Jaak Panksepp identified 7 fundamental networks of emotion in the brain: Seeking, Rage, Fear, Lust, Care, Panic/Grief, and Play. Panksepp’s work has led him to conclude that basic emotion emerges not from the cerebral cortex, associated with complex thought in humans, but from deep, ancient brain structures, including the amygdala and the hypothalamus. OK, this is getting technical now but is an important consideration in understanding why controlling our emotions can be so challenging. And why we cant just think our way out of our feelings. , the amygdala, and the hypothalamus. The limbic brain is the seat of the value judgments that we make, often unconsciously, that exert such a strong influence on our behaviour. What can we do to develop our self-awareness? 1: The use or psychometric tools can be helpful. One of the best which I have come across is the Human Synergistic’s Life Styles Inventory. It divides the respondents core traits into 3 main styles, aggressive defensive, passive defensive and constructive. It’s a growth model that can help the individual learn more about their behaviors and how they can modify these. 2: Journaling is a well recognised way of better understanding our internal worlds. the act of writing daily about how we feel focuses the mind to become more observant as to what is being felt and how we are reacting to these feelings. 3: Seek honest feedback. this is not an easy one as for many of us, our natural reaction is to get defensive when we are given feedback. Compounded to this is most people are not used to being radically honest in their feedback. That said, if we can cultivate relationships with people that are willing to have a more honest and authentic relationship with us, we can learn and grow more through this rich exchange. 4: JADE – No Justification, No Arguing, No Defensiveness and No Explaining – JUST LISTEN Moreover, when you are busy using JADE, you miss what the person is trying to tell you. If on the other hand you listen and accept feedback without defending yourself, you’re more likely to hear what you need to hear, increasing your credibility with the person giving you feedback and creating a trust bond that will enable them to continue providing useful feedback in the future. 5: Invest in a Coach. This person acts as a mirror and can reflect back our own behaviors. Its important we find a coach that has done their own self-development work so they are clear as to when they might be bringing their own material into the coaching relationship and projecting their own unmet wants and desires. When we have a strong emotional reaction to an interpersonal exchange, chancers are, our own material is being triggered. A self-aware coach will recognize this, be able to contain their feelings and take them away to work through in a more appropriate space, usually with their own coaching supervisor. Becoming a self-aware leader doesn’t happen overnight. Rather, it takes years of deep work, reflection, introspection, and difficult conversations with those you work with. Investing in your own personal growth will encourage a more inclusive and successful culture within your business. With time, the more conscious you become, the more comfortable you will be in being open, transparent, and even vulnerable.